Dr Richard Kurin, director of the Smithsonian's National Programs and the Smithsonian's Center for Folklife and Cultural Heritage, in Washington DC, presented public talks across New Zealand and Melbourne, Canberra and Sydney during November. We know of stockbrokers and mortgage brokers. But what is a 'cultural broker'? Cultural brokers successfully translate for the public a culture that is not their own. A cultural broker develops new and mainstream audiences for diverse cultures. Dr Kurin is the creator of the term 'cultural brokerage' and illustrated his talk by presenting a selection of Smithsonian case studies. Dr Kurin is an expert on indigenous knowledge systems, cultural change, heritage, museum practice and cultural representation. His publications include Reflections of a Culture Broker: A View from the Smithsonian, Aditi: The Living Arts of India and Smithsonian Folklife Festival: Culture Of, By, and For the People . Dr Kurin is a former Fulbright fellow. At the Smithsonian Dr Kurin oversees traveling exhibitions, public programs and lectures, education and museum studies, and a network of more than 100 affiliate museums. He is currently working on the Smithsonian Global Sound project to offer digital downloads of music on the web from a network of the world's archives. 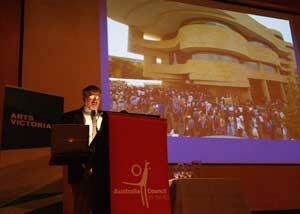 He advises the Rockefeller Foundation, the Library of Congress and UNESCO. In September, Dr Kurin produced the opening of the National Museum of the American Indian and the First Americans Festival, an immense program that brought together 75,000 Native Americans, from the rain forest of the Amazon, Central America, North Dakota all the way to Northern Canada to the historic Washington Mall where the Rev. Martin Luther King made his most famous speech heralding the establishment of the civil rights movement. The Smithsonian Center for Folklife and Cultural Heritage promotes the understanding grass root cultures, through the the Smithsonian Folklife Festival, the largest world and roots music producer and distributor, Smithsonian Folkways Recordings, and educational materials. The Center instigates cultural policy research, produces documentary films and videos; offers fellowships and training programs. For 158 years the Smithsonian has remained true to its mission, which is "the increase and diffusion of knowledge". Download Dr Kurin's lecture transcript, presented in Canberra, October 2004. 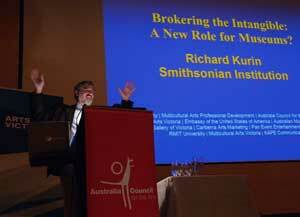 Dr Richard Kurin at the National Gallery of Victoria. Photos above and top by Hwa Goh. Presented by the Australia Council for the Arts, Multicultural Arts Professional Development, Arts Victoria, the Embassy of the United States of America, Kape Communications, the Australian Multicultural Foundation, Canberra Arts Marketing and RMIT University Business. PARTNERS: This program has been supported by the Australia Council's Audience & Market Development Division and Arts Victoria; Smithsonian Center for Folklife and Cultural Heritage, United States Embassy of America, Te Papa National Services Te Paerangi, Kape Communications, Multicultural Arts Professional Development, Australian Multicultural Foundation and RMIT Business. SUPPORTERS: National Gallery of Victoria, Canberra Arts Marketing, Cultural Infusion, Pan Event Entertainment and Multicultural Arts Victoria.